the Silence echoes your name. This mixed media piece, "Cave of the Heart," is an ACEO assemblage. ACEO stands for "Art Cards Editions and Originals." 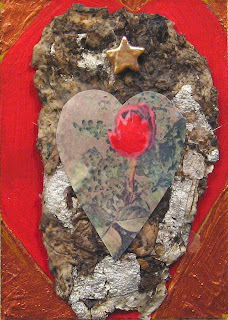 ACEOs are small 2.5 inches by 3.5 inches. Usually they are flat, and I have done some ACEO colored pencil drawings (you can look back through my blog to find them), but this was my first attempt to translate my larger assemblages, which I can no longer do because of lack of studio space, into a smaller format. The components are: mat board, dirt with aluminum foill, paper, paint, mother of pearl star, matte and gel medium. My "Cave of the Heart" is very earthy. The lotus is also a sacred symbol in Hindu art and literature; it stands for the purity of the Self rising out of the muck of the ego. This is gorgeous and the meaning behind it was very interesting to learn. This is beautiful Linda! I also enjoyed reading your song. I hope you make many more ACEO's like this! This is an awesome ACEO! I like the mixture of elements and how they reflect your meanings. Aren't ACEOs fun!! Great texture - nice combination of materials! I like the words to your song. Rae, I loved your story just as much as the piece itself (I didn't know you were a songwriter too!). What a fantastic idea to compress your assemblages into the space of an ACEO--wow, I bet that's a challenge but an eye-opener as well. Can't wait to see more of these.